Painting is my first and foremost profession. The tools have changed but the inner vision is the same. 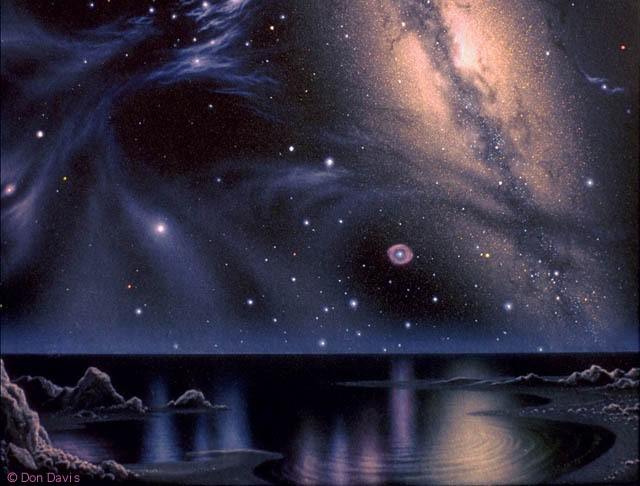 Please note: All my images on this site are copyrighted, unless specifically labeled as being in the 'Public Domain', such as in the case of my NASA art. You may download any of the images, use them in personal startup screens, and share them with friends so long as the copyright notices are not removed. They may not be used in any shareware, freeware, or commercial product, publication or other media without arrangements with the artist. I have high res files of these and many more works available upon inquiry. New traditional painting! Based on Heinlein's 'Moon Is A Harsh Mistress'. Some of my Dinosaur work can be found HERE. 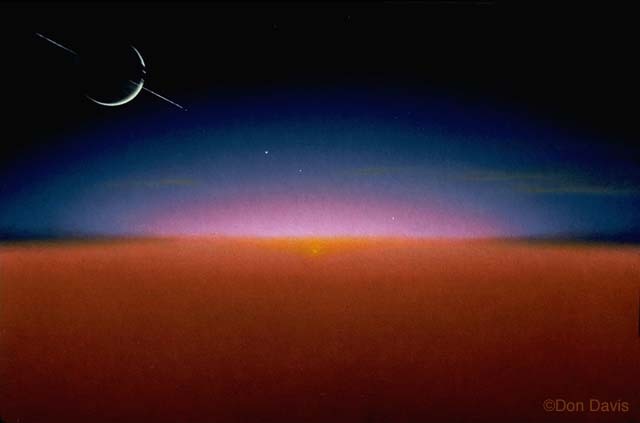 Although Saturn's large moon, Titan, has a dense atmosphere all but shrouding its surface in visible light, above the tan haze one could have a splendid view of the edge on ringed planet and its other satellites. The play of light in the upper atmosphere is another attraction of this vantage point. oils on board. 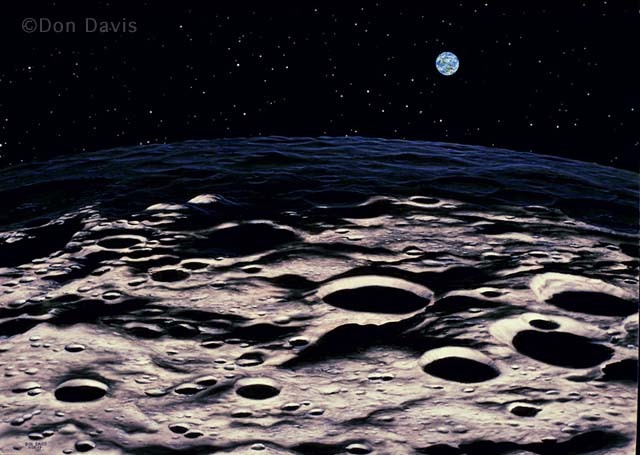 Above the Southern pole of the Moon we see the Earth softly illuminating what to us would be the 'New Moon'. The region poorly lit by both the Earth light and the Sun behind us was for a long time poorly photographed, and is where deposits of ice rich soil are believed to exist. Acrylics and airbrush inks on board. 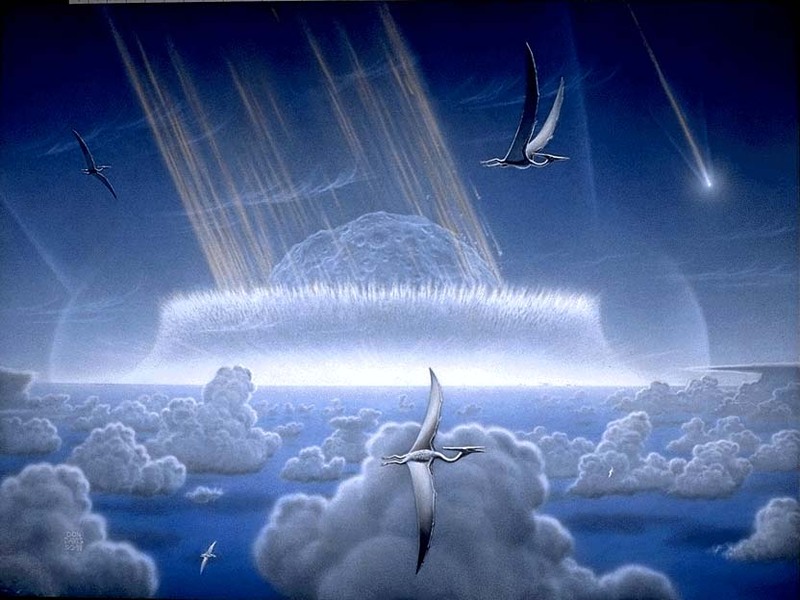 The infamous K-T impact event 65 million years ago (64.98 plus or minus 50,000 years), imagined here just as the bolide strikes, as seen by some high flying Pteranodons. 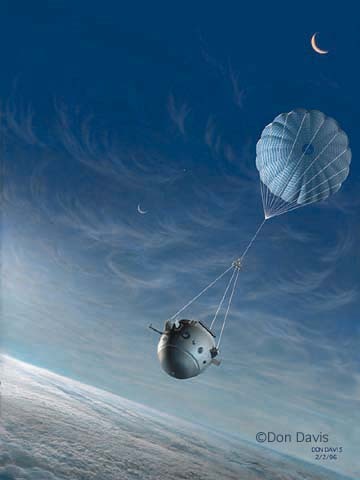 artwork for NASA. Acrylics and airbrush inks on board. This orbital view of the K-T event is some 45 seconds after the impact, with an immense cloud of molten droplets of target and projectile material spreading into space. The ejected material is still climbing, and widespread regions are on fire from the initial thermal 'heat flash' from the sheer brilliance of the entering bolide. Acrylics and airbrush inks on board. 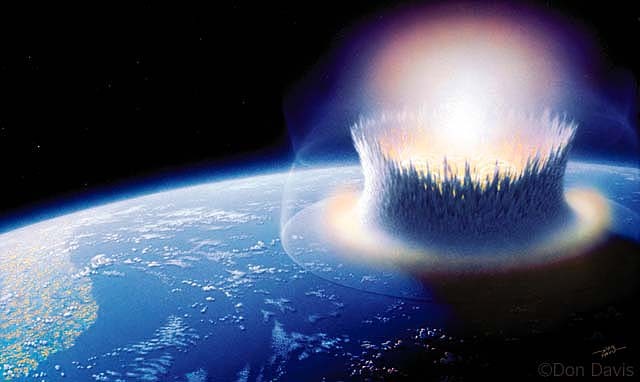 Mars and Earth have both sustained many impacts over geologic time, and occasionally meteorites from Mars fall on Earth. In this two panel view first we see, on the left, a sizable impact blasting a crater and scatters meteoric fragments. If life forms from Mars survived the process Earth may have been occasionally inoculated with extraterrestrial microbes, indicated on the right view by colonies of yellowish mold like stuff spreading from the impact scars. Painted entirely in Photoshop. The Galileo probe in the atmosphere of Jupiter. 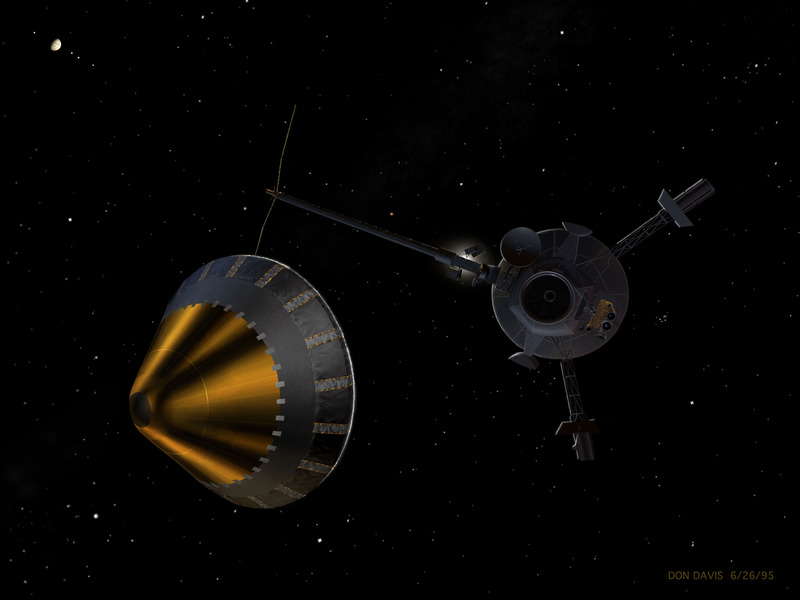 The probe was elaborately modeled, then placed against a background partially composed from art elements left over from my NASA Galileo animation. Used as a cover for Sky and Telescope.Modeled in form Z, rendered in Electric Image, finished in Photoshop. 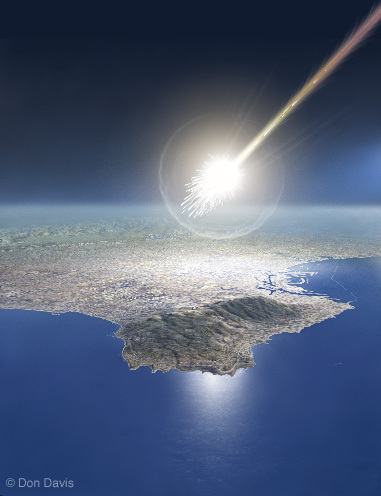 A large meteor similar to the object which devastated the forests of Tunguska in 1908 explodes over Los Angeles. Cover for Sky and Telescope. Modeled in Cybermesh, rendered in Electric Image, finished in Photoshop. 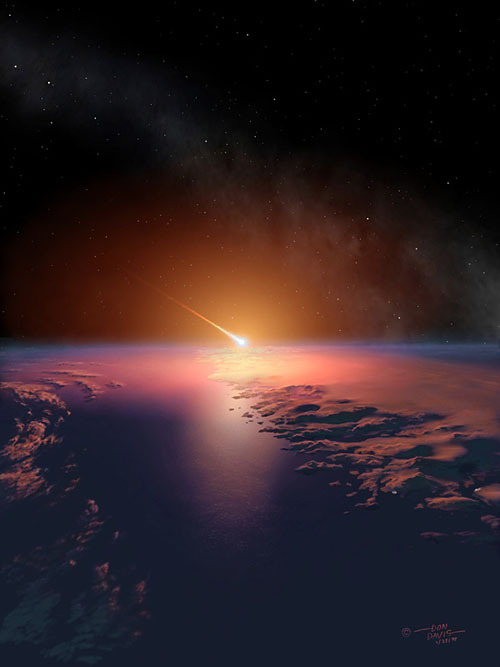 The cold arctic night of December 9, 1997 was interrupted for several momentous seconds by a widely seen flash in the sky at about 5:11 A.M. local time (08:11 GMT) This view attempts to reconstruct the view , as it may have appeared from the fringes of the atmosphere, as the large fireball entered the atmosphere.Modeled in Cybermesh, rendered in Electric Image, finished in Photoshop. 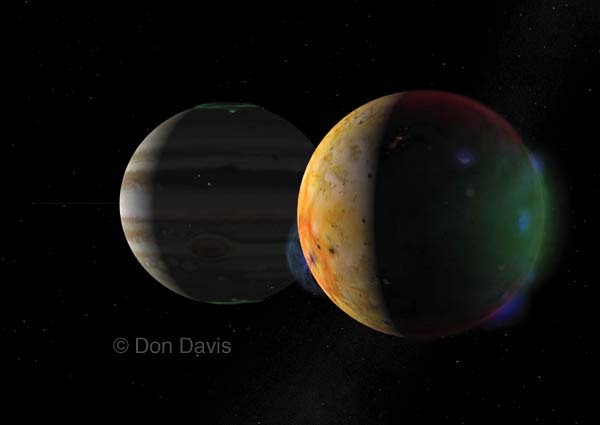 Jupiter's volcanic moon Io glows with aurora and airglow like emmissions which have been photographed by Galileo when the satellite enters Jupiter's shadow. Hot lava in some of the volcanoes can also be seen. Jupiter's own bright aurora glow near the poles, inclucing a spot below the main auroral loop which traces a connection between Jupiter's magnetic field and Io itself. Lightning also intermittently appears inside Jupiter's nighttime clouds. 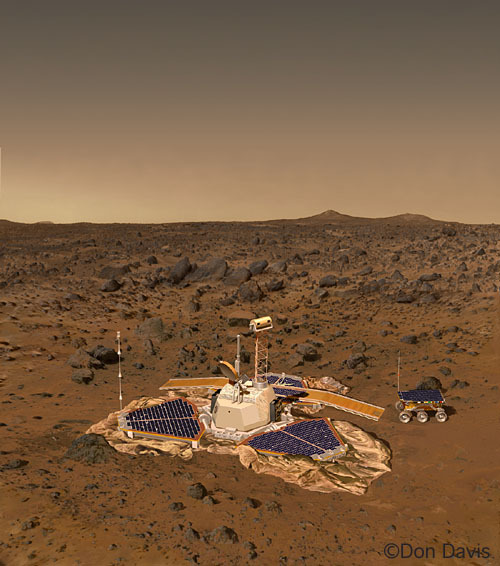 The Mars Pathfinder Lander and its surroundings. Digital models and artwork were blended together to 'step back' from the spacecraft. Modeled in form Z and Cybermesh, rendered in Electric Image, finished in Photoshop. At some point paintings, models, and animations are merged. 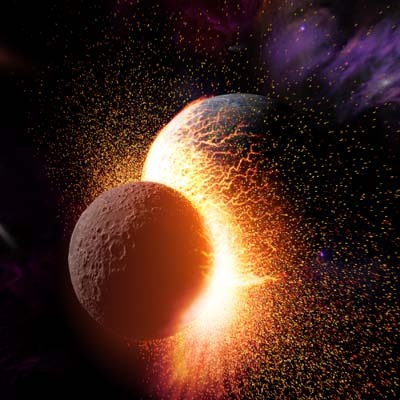 Frame cropped from an all dome animation of the formation of the Moon from the debris of a primordial collision between the Earth and a Mars sized body. Rendered in Electric Image, finished in After Effects. My 'digital Saturn' rendered in Electric Image. 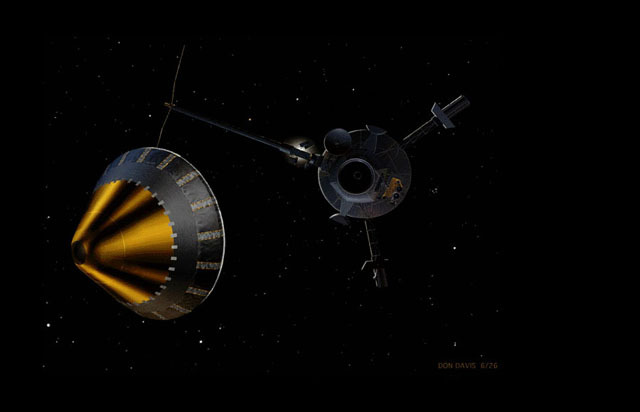 The Galileo Probe separates from the Orbiter months before arrival at Jupiter. The creation of this painting is described elsewhere in this site. Rendered in Electric Image, heavily repainted in Photoshop. This public Domain piece is offered as a 4K pixel wide jpeg here.